BoDean Company is a quality supplier of many natural aggregate products through the mining of its two quarries: The BoDean Forestville Quarry and the Mark West Quarry. However, in keeping with its desires to reduce its carbon footprint and increase sustainability, the company can also supply customers with a more environmentally friendly, green product through its recycled CLII base rock. What is Recycled CLII Base Rock? Recycled CLII base rock is a sustainable product made from 100-percent recycled rock material that is often times taken from concrete or concrete asphalt products. Class II base rock is a highly compactable product that is formed from crushed rock of varying sizes. Recycled base rock differs from virgin base rock in that it is not directly mined from one of the BoDean Company’s two quarries. Recycled CLII base rock, instead, comes from structures that have already had a life and are in need of replacement themselves. Torn down roadways, curbs, gutters and other rock structures can be broken down, re-crushed and reprocessed to form what is called recycled CLII base rock. Because it is a recycled material, this product may contain crushed concrete, asphalt, porcelain, brick and blog. While BoDean Company can offer varying color options on its virgin materials, because recycled CLII base rock comes from various, already used rock, the color in it may vary from product to product. There are many benefits to using recycled products. The use of recycled aggregate material is a more economical option as it is an easy way to save money for local governments that are rebuilding roadways, as well as other purchasers and customers in need of a stabilization product. Using Recycled CLII Base can also help conserve natural, or virgin aggregate resources while providing the same product, quality and function. How is Recycled CLII Base rock used? Recycled CLII base rock can serve many of the same functions and applications of virgin base rock. It is designed to form a base in large construction projects and can be used in applications from road and driveway construction, stabilization beneath structures, patios, slabs, parking lots and sidewalks. Driveways and Roadways – Recycled CLII Base Rock, which comes from torn up roadways and driveways, can also serve as an essential part of rebuilding them. This product is typically placed below the roadway surface or beneath the asphalt of driveways. 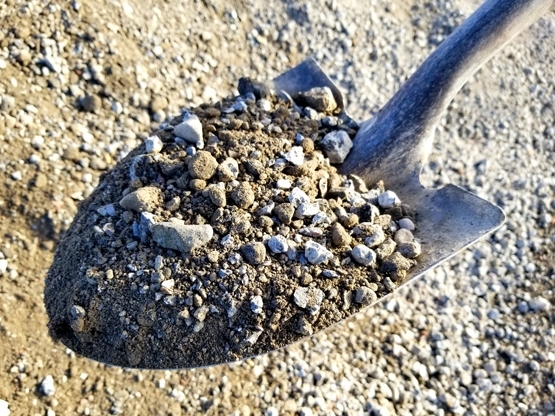 Parking Areas – Recycled CLII base rock is ideal aggregate material to be placed in the foundation for building parking areas for trailers, boats and RVs. Large Structure Foundation – Recycled CLII base rock can be used for small foundation areas like sheds, patio bar areas and other small areas that would benefit from structured pad area. Quality products and customer service are a priority for BoDean Company but seeking to improve the company’s environmental standards and working to meet all specifications set before it is also a goal that BoDean strives to meet on a regular basis. All aggregate products mined and produced at BoDean meets all local city, state and government specifications. Recycled CLII base rock is considered a green product because it conserves natural resources, it can also qualify for Leadership in Energy and Environmental Design (LEED®) credits. With regulations and standards being set at various levels, BoDean Company works to stay in compliance with both City of Santa Rosa Spec Base Rock as well as CalTran Spec Base Rock. The City of Santa Rosa Design and Construction Standards are adopted by the City Council to specify how city facilities are to be constructed. Through its traditional mining efforts, BoDean Company ensures that no product is wasted as it is all sent through a screening process. Add to it the company’s desire to use recycled material where it can and all is set to paving the way to a more sustainable future. Whatever project is set before you, the most important step to beginning is selecting the right materials to ensure stability, quality and success. If you are considering a base rock product for your project, contact a BoDean Company specialist to find out if recycled CLII base rock is the product to get the job done. Call today at (707) 576-8205 to speak with one of our specialists or click here to request a free online quote.